Melt-in-the-mouth biscuits made with dessicated coconut and ground almonds topped with caramelised pineapple. 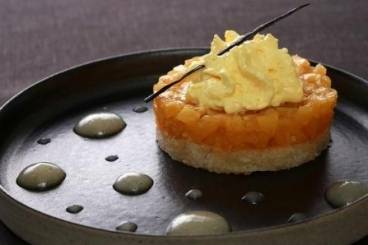 This dessert is full of texture and is served with a passion fruit and olive oil emulsion and a lime, honey and vanilla drizzle. Sift the icing sugar and combine with the ground almonds and the dessicated coconut. Whisk the egg whites and the caster sugar to stiff peaks and then combine with the dry mixture using a flexible spatula. Pour the mixture into individual serving rings and smooth the top. Transfer to the oven and bake for 12 minutes. Peel the pineapple using a serrated knife and the remove the core. Cut the fruit into small dice. Pour the sugar into a frying pan and allow to melt to a caramel. Once golden brown, add the diced pineapple and cook over a high heat for 3 minutes. Mix the passion fruit puree with the cream and place in a siphon. Charge the siphon with gas and chill until ready to serve. Place the lime zest and juice, honey, vanilla seeds and the olive oil in a bowl and mix together. Place a coconut biscuit in the centre of each plate and top with caramelised pineapple. Top with the passion fruit and olive oil emulsion and finish with a drizzle of lime sauce.